We are excited to continue with our Texas Blogger Series! But we wanted to remind you of our link up party going on right now and especially the GIVEAWAY!! Go ahead and enter AND link up your awesomeness!! Howdy y'all! My name is Laura and I'm so glad to be here at Natural Nesters! 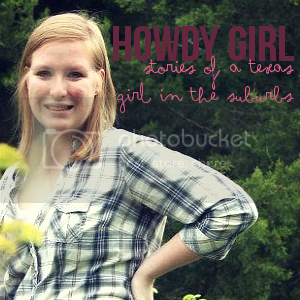 If you couldn't tell already, I am indeed from Texas and I blog at Howdy Girl (see, going with the Texas theme!) I'll be a freshman at Sam Houston State in the fall, so I have no intention of leaving the wonderful state I call home. All of my life, I've lived in the Metroplex. No, we aren't a metropolitan area like all the other big cities in the country, we're the Metroplex. For all y'all who don't know what that is, here's a map of the Metroplex. Yes, Dallas-Fort Worth is not a metropolitan area, we're the Metroplex. And since we have our own name, that automatically makes us cooler than every other metropolitan area in the country (okay, Texas metropolitan areas are pretty awesome too -BUT just because they're from Texas). I've lived here my whole life. When I pack up and move to Huntsville (just an hour north of Houston) in August, that'll be the second time in my life that I've moved. The last time I moved, it was just across town to a bigger house. Texas, and the metroplex have definitely defined me in a way. I love the Texas Rangers and the Dallas Mavericks. I love how the whole metroplex has united itself behind the Rangers these past few years. It's been a crazy ride. There's a thirty plus mile difference between Dallas and Fort Worth, but I love how we're all united as a whole. We're a little bit of everything. We're all part of a big metropolitan area, but we're still Texas to the core (no, that does not mean we ride horses to school - well, unless you count Ford Mustangs). It really is the best of both worlds, and I'll admit, I'll miss it when I move. Needless to say, I love Texas and I'm a Metroplex Girl.